Yep! I’m a French Bulldog so I am Francophille! J’adore France! The original meaning of かぶれ ( = kabure) is a rash or inflammation from something. 〜にかぶれた。( =~ni kabureta.) to react to something, get a rash or inflammation from something. The other meaning of かぶれ ( = kabure) or かぶれる ( = kabureru) is to get overly influenced / infected by something or to be big on something. (Usually some culture but we can also use it to describe a person who is a huge fan of somebody. 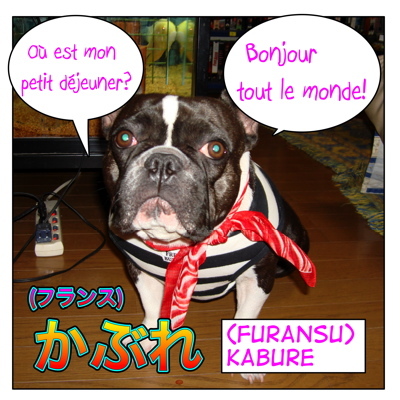 フランスかぶれ ( = Furansu kabure) is a person who is overly influenced by French culture or addicted to France. Imagine someone who has just visited France and she always talks about France or tries to adopt everything from French culture.It is often used with country names which you long for. = Sakki Maggie sensei ga waki ni furanse pan wo kakaete aruite itayo. = I just saw Maggie-sensei walking with a baguette under her arm! = Aa Maggie sensei wa furansu kabure dakara ne. = Yeah, she is crazy about France. = Oneesan sengetsu amerika kara kaette kitano? = Mone wa ukiyoe no eikyou wo tsuyoku uketa to iwareru. = It is said that Monet was strongly influence by Ukiyo-e.
= Watashi wa Maggie sensei ni kanka sarete nihongo no benkyou wo hajimeta. = Influenced by Maggi-sensei, I have started to study Japanese. = Kanojo wa sukkari america ni somatte kaette kita. = She came back completely Americanized. OK, let’s move on to the next verb which is かぶる ( = kaburu). It is a relatively new verb which came from mah-jong terms. *損害を被る ( = songai wo koumuru* different way of reading) to suffer a loss, etc. 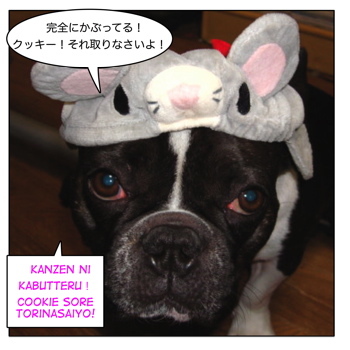 But today I will introduce you another meaning of かぶる ( = kaburu). Can you guess the meaning from the below pictures? = Geh! 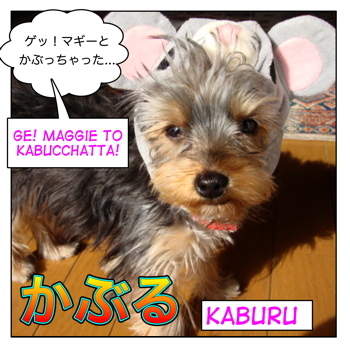 Maggie to kabucchatta! = Kanzen ni kabutteru! Cookie sore torinasai yo! 「かぶる」( = kaburu) means to overlap, to have someting exactly the same or very similar. Have you ever had an experience that you find somebody wearing exactly the same clothes as yours in a party? Very awkward, right? You can use 「かぶる」 ( = kaburu) for that kind of situation! = To happen to wear / have the same thing as somebody. = Doushite kono baggu kawanaino? = Anoko to kabucchau kara. = Adam Sandler to Ben Stiller tte nanka kyara ga kaburu yone. = Watashi no ru puchi dejune, ie asagohan mada kashira? = Kurowassan to kafe ore ni shitene.